There was always going to be something beautiful at the corner of 8th and F Streets in northwest Washington D.C. Pierre L’Enfant, in his earliest plans for the city, originally designated the site for a hall of American heroes. Nearly fifty years later, in 1836, President Andrew Jackson authorized the construction of the United States Patent Office Building as a tribute to American innovation. It was given the nickname “temple of the useful arts” for the numerous patent models on view in its main gallery. 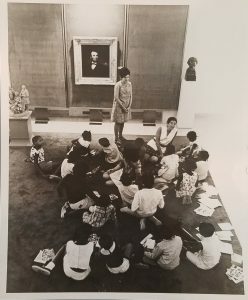 Over a century later, in 1968 the art collection that would become the Smithsonian American Art Museum (SAAM); the National Portrait Gallery; and the Library that supported both moved into this grand downtown space. Now the Old Patent Office Building is home to a different kind of art—one that is still very useful, in its own way. As part of Smithsonian Libraries 50th anniversary celebration, visitors to the AA/PG Library can view highlights from the Patent Office in its heyday, as well as memorabilia from the edifice’s early years as the home to several Smithsonian entities. After years of materials shortages and Congressional interference, the Patent Office Building was opened to the public in 1840 (construction was ultimately completed in 1865). Its top floor was almost 300ft long with 30ft ceilings supported by columns. Architect Robert Mills called this space the largest exhibition hall in the country. 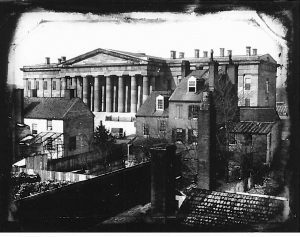 By the 1850s, the hall would become a major tourist attraction known as a “museum of curiosities” with items such as the original Declaration of Independence, a mosaic from Pompeii, and a piece of Plymouth rock. There were also thousands of patent models on display. 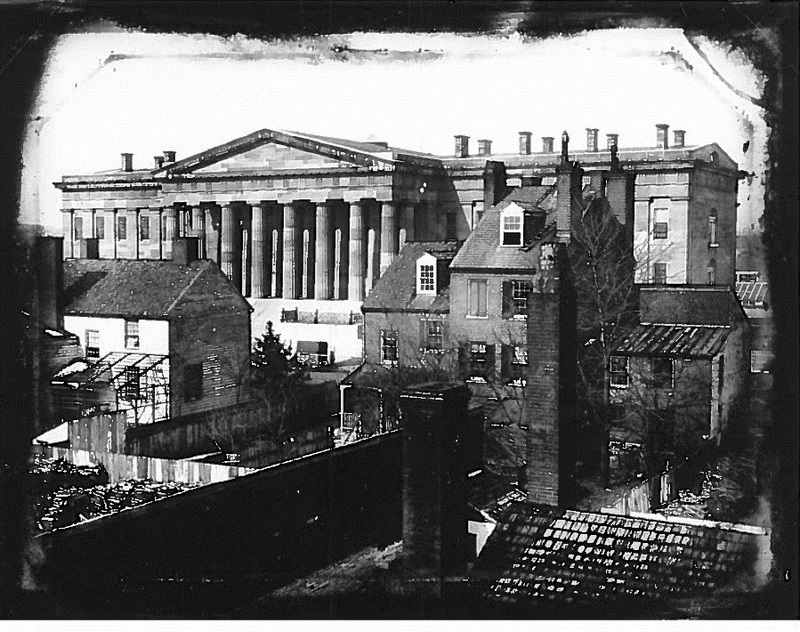 Before the opening of the Smithsonian Castle in 1858, the gallery at the Patent Office attracted over 100,000 visitors a year. 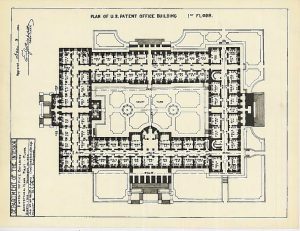 The first floor plan from the US Patent Office Building from 1920. . Photo Credit: From the U.S. Patent Office Image Files. By 1908, the public fascination with patent office models had waned significantly. They were taken out of display and put into storage. In 1926 the models were given to museums across the country; given to the families of their inventors; or sold at auction. The staff of the Patent Office would leave the building in 1932. They were absorbed as a department of the newly formed Department of Commerce, and moved a short distance from the White House. The Civil Service Commission took over and transformed the former “temple of invention” into a quotidian office building with fluorescent lights and linoleum laid over the marble. This marked the beginning of a decades’ long decline. The lowest point came in 1953 when Congress introduced legislation that would have demolished the Old Patent Office Building and replaced it with a parking garage. Fortunately David Finley, chairman of the newly formed US Commission of Fine Arts, caught the ear of President Eisenhower and convinced him that the historic building was worth saving. Eisenhower ordered the General Services Administration (GSA) to preserve the building. Three years later, in 1958, it was turned over to the Smithsonian Institution. In 1965 it was listed on the register of Historic Places by the Department of the Interior. A group from neighboring Calvary Baptist Church discusses a portrait of Abraham Lincoln. (1968)Photo Credit: From the U.S. Patent Office Image Files. In May of 1968, cheers rang through the halls of the Old Patent Office Building as President Johnson cut the ribbon at the grand opening of the National Collection of Fine Art (now SAAM). For the collection’s curators and stewards, it was a homecoming long in the making. Though founding artworks for the Collection were given to the Smithsonian in 1865 as the original National Gallery of Art, the search for a permanent location didn’t begin in earnest until 1937. 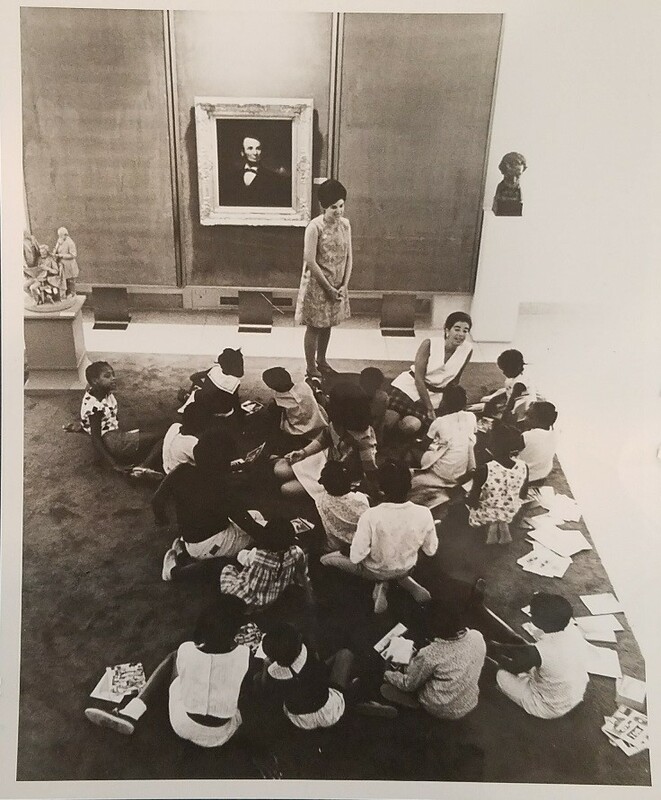 For much of its life the National Collection of Fine Art was in search of a permanent home, first in the Smithsonian Castle, and in what is now the Arts & Industries Building and the National Museum of Natural History. Because the National Portrait Gallery is as concerned with the subjects of the portraits on the walls as they are with the people who created the works, the Library had to develop a somewhat atypical collection to support their research needs. The NCFA/NPG Library collected artist monographs and art history texts, with a focus on American art, as well as history and biography. The American Art/Portrait Gallery continues this practice, today; setting itself apart from similar art libraries and providing valuable resources to patrons interested in the intersections of art and American history. In 1968, the Library settled in the beautifully renovated space, which is now home to the Luce Center. Interested in our exhibit? If you’re in the neighborhood you can visit the AA/PG Library from 10am-5pm on weekdays. Want to learn more about the Old Patent Office Building? You can always Ask A Librarian. Previous Post The Fix: Welcome Ludivine Javelaud!